Retraite de M & M est situé sur Otter Lake, en haut de l'abri de l'eau. Vous pourrez profiter des activités nautiques claires vierges sur ce calme baie de Otter Lake. Détendez-vous sur la terrasse privée, ou vers le bas par l'eau avec une boisson et un être cher et apprécier le silence, la nature et l'air frais. La balançoire dans la partie grillagée est également un lieu de prédilection dans la soirée ou le matin pour le petit déjeuner à notre petite table. La maison dormira confortablement 12 avec 2 suites de maître avec salles de bain complètes à proximité, une salle de bains avec sauna, et l'autre avec baignoire à remous. Had a wonderful stay and very much enjoyed the swimming. Very nice place. Clean, very well maintained and had all the things you need to spend a lovely week of vacation. Nice swimming at the water with a fun rock to climb on and jump off of. There was plenty of room to share with another family. My family had a wonderful week at the cottage. The amenities were perfect, and the lake was beautiful. We caught many fish and enjoyed swimming, relaxing, and enjoying the fresh air. The closest town is near enough for convenience, but just far enough to make the cottage feel very private. I would highly recommend this cottage to anyone. Thank you for a wonderful vacation! Very pleasant place for a large gathering to enjoy some time together. family of 12 very much enjoyed the experience. Owners were very pleasant and accommodating. We had a girls weekend at this beautiful home. It is very spacious with lots of room for everyone. It is very clean and well kept. The property is quite private with lots of trees surrounding the home. Home owners were very accommodating and quick to respond to any questions. Thanks for sharing your home with us! I stayed at M & M's Retreat for three nights in September with 9 friends. It was a great weekend of cottage fun. We were planning to go golfing, but decided to enjoy the lake and the cottage instead. The cottage is spacious, we did not feel cramped at all and the surrounding trees block the neighbouring cottages from view. There are only 5 or 6 docks on the bay. The ping pong table and sauna were very popular. The walk to the water is nice and the grassy area down by the water was great for lawn games and got sun in to the late afternoon. The swimming was excellent. It seems to be a shallow bay, but there is a drop off right at the end of the dock. I was lucky enough to catch a 4 lb large mouth bass right off the dock. Plenty of fish if you have kids and want them to catch a lot of them. I also saw some beavers and herons on the lake. The boats provided are in great condition and there are lifejackets and paddles for everyone. 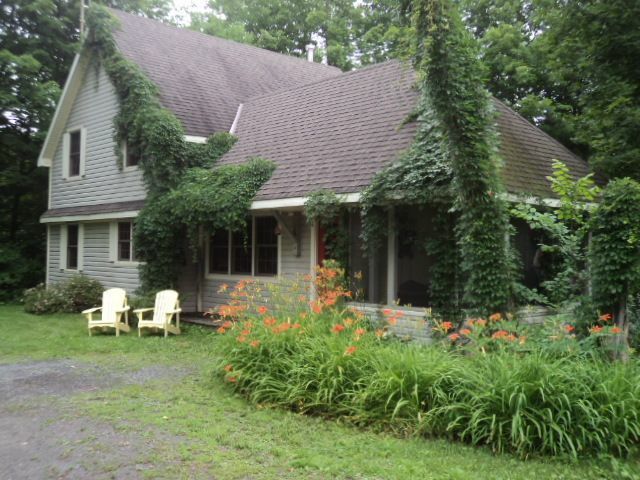 Overall this was a great cottage and I would definitely consider renting it again. The pictures do not do it justice. Thanks M & M for a great weekend. We loved our stay at this very well kept, quiet, pristine cottage! Thank you so much to Monica and Mike for your wonderful hospitality in making sure everything was wonderful for us! Notre propriété est située à moins de 1 km du centre de la piste de Frontenac parc provincial (de camping sauvage uniquement) qui offre beaucoup de sentiers et de portages de randonnée balisés.